Applying conditional formatting in a Pivot Table can be a bit tricky. Given that Pivot Tables are so dynamic and the data in the backend can change often, you need to know the right way to use conditional formatting in a pivot table in Excel. Let’s first look at the regular way of applying conditional formatting in a pivot table. 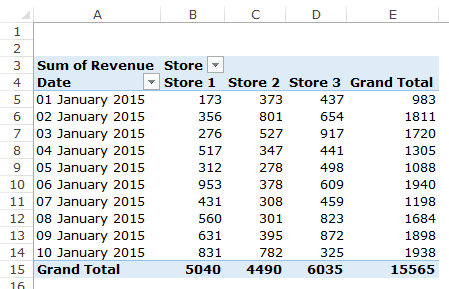 In the above dataset, the date is in the rows and we have store sales data in columns. Select the data (in this case, we are applying the conditional formatting to B5:D14). 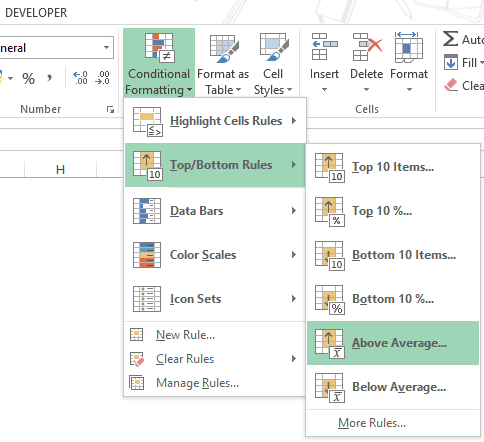 Go to Home –> Conditional Formatting –> Top/Bottom Rules –> Above Average. Specify the format (I am using “Green Fill with Dard Green Text”). All the data points which are above the average of the entire dataset have been highlighted. The issue with this method is that it has applied the conditional format to a fixed range of cells (B5:D14). If you add data in the backend and refresh this pivot table, the conditional formatting would not get applied to it. For example, I go back to the dataset and add data for one more date (11 January 2015). This is what I get when I refresh the Pivot Table. As you can see in the pic above, the data for 11 January 2015 doesn’t get highlighted (while it should as the values for Store 1 and Store 3 are above average). The reason, as I mentioned above, is that the conditional formatting has been applied on a fixed range (B5:D14), and it doesn’t get extended to new data in the pivot table. Here are two methods to make sure conditional formatting works even when there is new data in the backend. This method uses the Pivot Table Formatting Options icon that appears as soon as you apply conditional formatting in a pivot table. 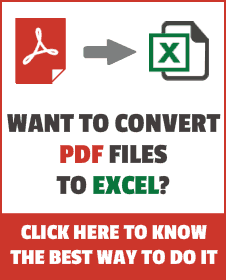 Select the data on which you want to apply conditional formatting. Selected Cells (which would be selected by default). All cells showing “Sum of Revenue” Values. 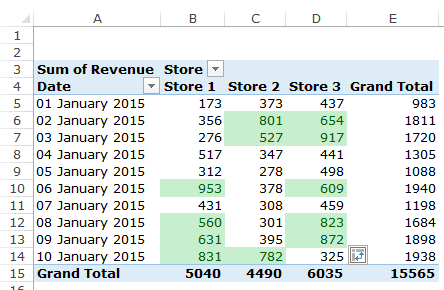 All cells showing “Sum of Revenue” values for “Date” and “Store”. 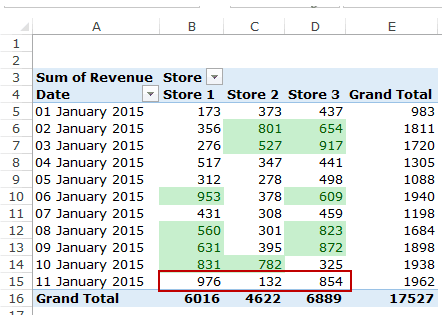 Select the third option – All cells showing “Sum of Revenue” values for “Date” and “Store”. Now when you add any data in the back end and refresh the pivot table, the additional data would automatically be covered by conditional formatting. Selected Cells: This is the default option where conditional formatting in applied only on the selected cells. All cells showing “Sum of Revenue” Values: In this option, it considers all the cells that show the Sum of Revenue values (or whatever data you have in the values section of the pivot table). The issue with this option is that it will also cover the Grand Total values and apply conditional formatting to it. All cells showing “Sum of Revenue” values for “Date” and “Store”: This is the best option in this case. It applies the conditional formatting to all the values (excluding Grand Totals) for the combination of Date and Store. Even if you add more data in the back end, this option will take care of it. The Formatting Options icon is visible right after you apply conditional formatting on the data set. If goes away if you do something else (edit a cell or change font/alignment, etc.). Conditional formatting goes away if you change the row/column fields. For example, if you remove Date field and apply it again, conditional formatting would be lost. 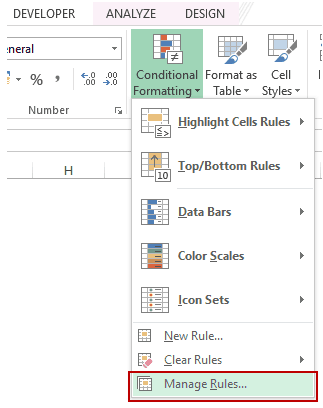 Apart from using the Formatting Options icon, you can also use the Conditional Formatting Rules Manager dialogue box to apply conditional formatting in a pivot table. 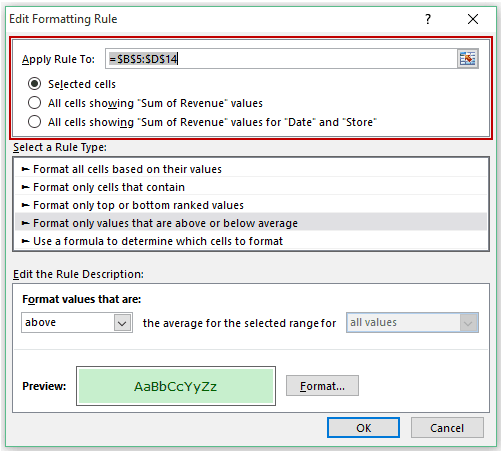 This method is useful when you have already applied the conditional formatting and you want to change the rules. Click Ok. This will apply the conditional formatting to the selected cells. Go to Home –> Conditional Formatting –> Manage Rules. In the Conditional Formatting Rules Manager, select the rule you want to edit and click on Edit Rule button. Select the third option and click OK. This will apply the conditional formatting to all the cells for ‘Date’ and ‘Store’ fields. Even if you change the backend data (add more store data or date data), the conditional formatting would be functional. Note: Conditional formatting goes away if you change the row/column fields. For example, if you remove Date field and apply it again, conditional formatting would be lost. Delete Pivot Table in Excel. I’m trying to conditional format my shared sites. This reporting is different there are no values meaning counting. We are actually reporting site names. Its hard could you help? Help! I’m not seeing the icon or the option in ‘Edit Rule’ you are referring to. Is there another route? I’m in Excel 2013 and I am using “Use a formula to determine which cells to format”, if one of those makes he difference. Special thanks, same as usual it was wonderful. wish u the best wherever you are . Nice tip. I learned something new today!